Photo by Bryan Stevens A male Eastern Towhee sings from an elevated perch. The fact that April is already so far advanced has caught me somewhat by surprise, which is surprising since there are plenty of signs letting me know spring’s approaching. For instance, each morning when I leave for work I usually hear a cacophony of singing birds, including Eastern Bluebirds, Song Sparrows, Tufted Titmice and Carolina Chickadees. The birds are stirring, and that always means the seasons are shifting. On bird that has been quite prominent in the yard for the past few weeks has been the Eastern Towhees. We had several individuals, both males and females, spend the winter near the feeders. I saw and identified my first Eastern Towhee in early spring in 1993. At that time, I was struggling to identify some of the common visitors at my feeders. I was acquainted with White-breasted Nuthatches, Blue Jays, Downy Woodpeckers, Carolina Wrens, Dark-eyed Juncos and a handful of other birds. When I looked out a window and saw this bird feeding on the ground, the morning sun illuminating his dramatic plumage of black, white and rufous red, I was immediately aware this visitor represented something new and unexpected. This pocket-sized reference guide helped many beginning birders learn to identify common backyard birds. 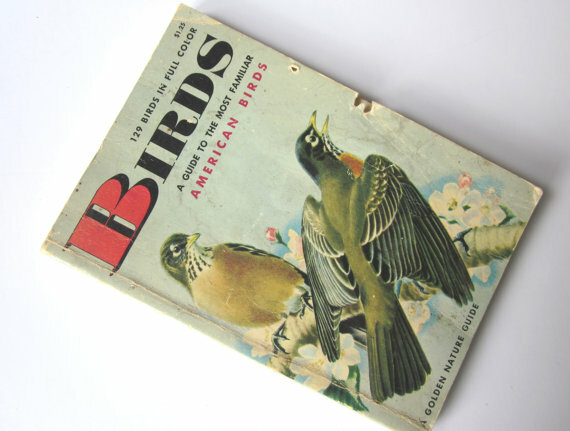 Consulting a field guide — I was using the Golden Nature Guide to the Most Familiar American Birds — I soon found a painted illustration of a Rufous-sided Towhee that matched in every detail the bird I had just observed on the ground beneath a Blue Spruce in my yard. 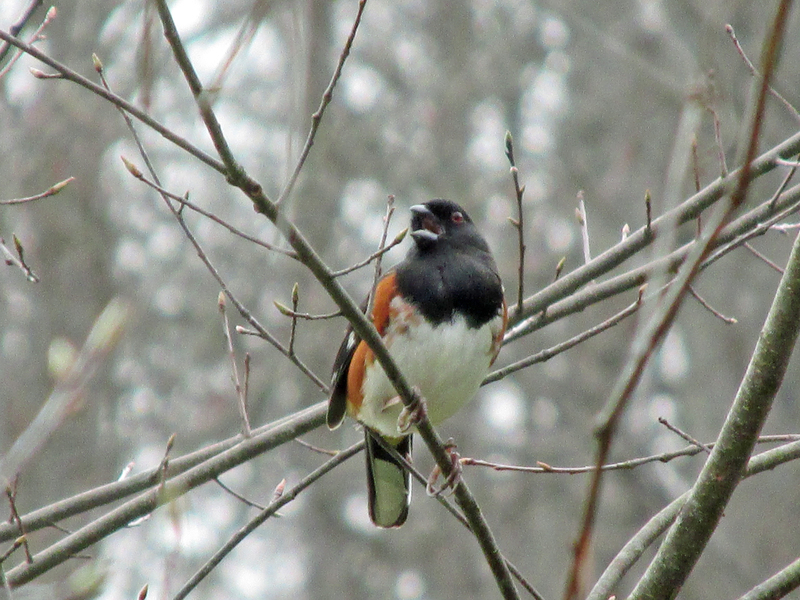 A male Spotted Towhee shows extensive spotting on its back. In 1995, ornithologists renamed the Rufous-sided Towhee to Eastern Towhee and also separated the Eastern Towhee from its western counterpart, the Spotted Towhee. Until that point, these two towhees had been considered different races of the same species. 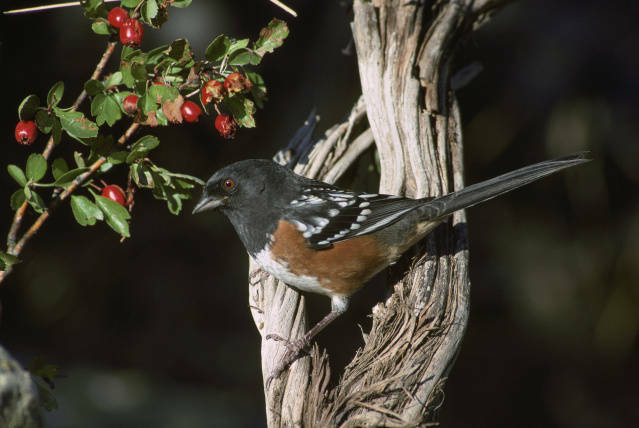 In 2003, I saw a Spotted Towhee during a visit to Salt Lake City, Utah. The bird looks almost identical to an Eastern Towhee except for considerable white spotting — hence its common name — on the bird’s back. Photo by U.S. Fish & Wildlife Service The female Eastern Towhee’s plumage is a rich, chocolate brown where the male’s feathers are black. 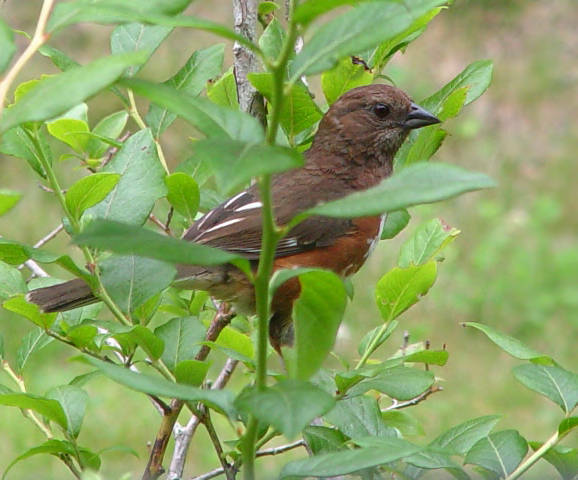 Eastern Towhees do spend a considerable amount of time on the ground and hidden in thickets and hedges. Other common names for this bird includes “Ground Robin” and “Swamp Robin.” They are one of the larger members of the sparrow family, however, and not related to the thrush family, which includes such birds as American Robin, Eastern Bluebird and Wood Thrush. Photo by Bryan Stevens Towhees spend much of their time on the ground when searching for food. Unlike the “brown” members of the sparrow family, the Eastern Towhee is a brightly colored bird. Males have a black hood. The black coloration extends into the back and tail. The belly is white and the sides are flanked with a rusty-red color. In flight, their black tails are bordered with white feathers, which produces a dramatic flash of contrasting colors. The female Eastern Towhee is an attractive bird in her own right. She shares the rufous sides and white coloration that are present in the male’s plumage. However, the male’s black feathers are replaced by a warm, chocolate brown plumage in the female. 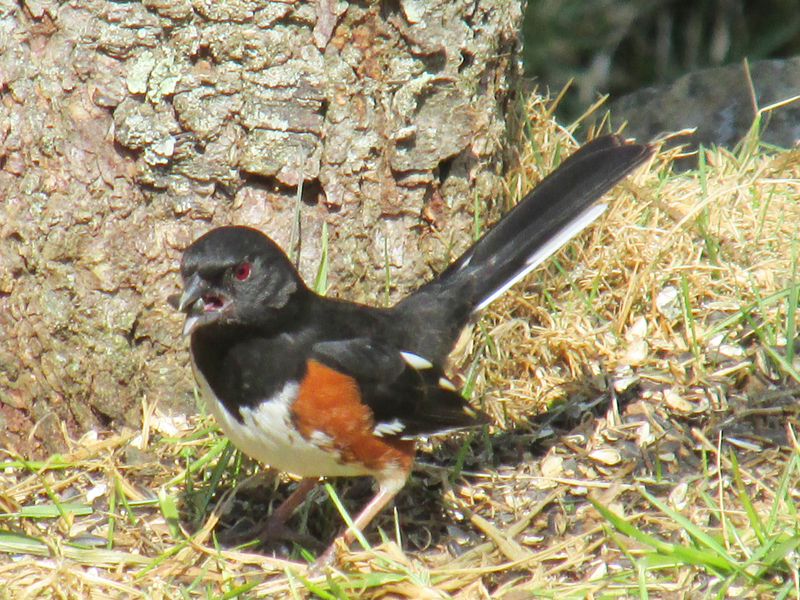 The Eastern Towhee is one of my favorite yard birds, but not just because of its dramatic appearance. These birds also have some instantly recognizable vocalizations. With the arrival of spring, the males will seek elevated perches for extensive singing bouts to attract mates and establish territories. Their song has been interpreted, quite accurately, as “Drink your tea!” They also have some alarm notes, such as “Chew-ink” and “Toe-Hee,” which is the basis for this bird’s common name. Photo by U.S. Fish & Wildlife Service Although the smallest member of the towhee family, the Green-tailed Towhee is still a larger bird than most members of the sparrow clan. They are often found in the same sort of tangled habitat favored by Northern Cardinals and Brown Thrashers. To attract these birds, don’t manicure every inch of your yard. Leave some wild corners that will provide shelter for birds that thrive under cover. In the southern United States, these birds thrive in scrub palmetto habitats. 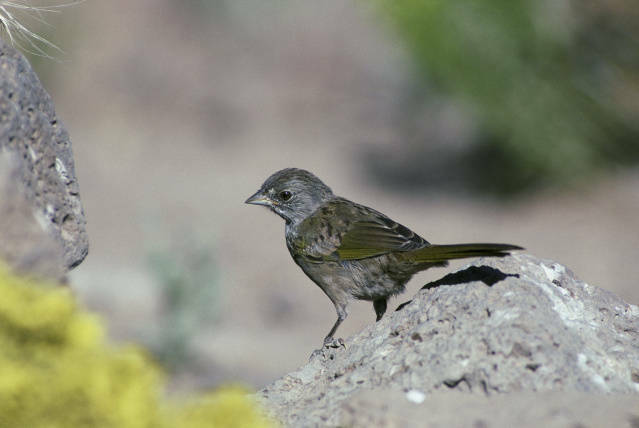 Other North American towhees include Green-tailed Towhee, Abert’s Towhee, California Towhee and Canyon Towhee. I want to close this week’s column by asking for help from readers. I love to document the yearly arrival of Ruby-throated Hummingbirds. I’d appreciate hearing from any readers who would like to share the information about their first hummingbird sighting of the season. Simply send me your name and location, as well as the date and time when your first hummingbird arrived. The best way to contact me is by my email at ahoodedwarbler@aol.com. Messages are also welcome through my Facebook account at http://www.facebook.com/ahoodedwarbler. 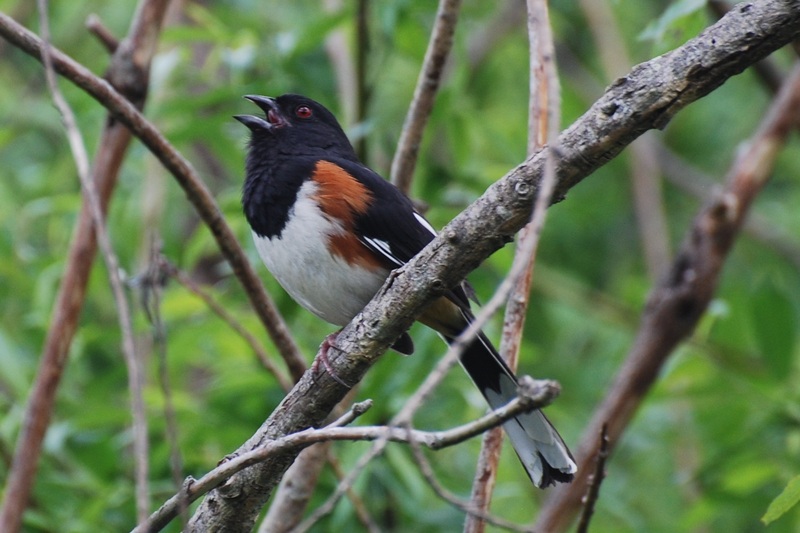 Photo Courtesy of Jean Potter The male Eastern Towhee sings persistently during the spring season. This entry was posted in Birding, Birds, Towhees and tagged Birdwatching, Bristol Herald Courier, Carter County Compass, Eastern Towhee, Elizabethton Star, Erwin Record, Feathered Friends, McDowell News, Nesting birds, Our Fine Feathered Friends, Rufous-sided towhee, Spring migration, Towhees on April 5, 2015 by Bryan Stevens.